The departure of the Compass Corona 382 for 2016 means that the end-washroom, parallel-lounge, two-berth Corona 462 is now the cheapest Compass tourer. But that doesn’t make it a budget model: this is very much a mid-market van that thinks it’s a flagship, with an impressive spec that includes Alde wet central heating, shock absorbers and an ATC stability system, all for a price that compares very competitively with lower-spec rivals. The shape is less stylish than the likes of the Sterling Eccles, but it follows the family look with sharp tinted windows and the exterior has been freshened up by simple yet attractive new graphics. Equipment additions for 2016 include a Teleco Teleplus directional TV aerial plus the large ‘Star-View’ rooflight over the lounge. And to see other Compass caravans for sale, click here. 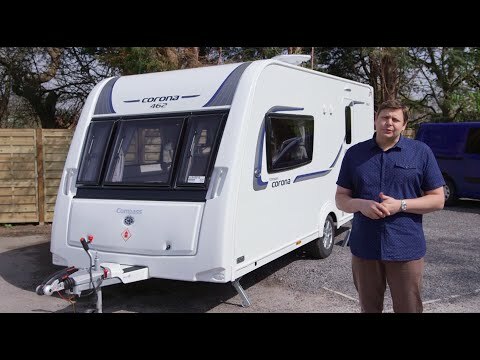 Like all Explorer Group caravans, the Corona is built using SoLiD fully bonded construction, with a GRP under-skin and one-piece aluminium sides. It rides on an Al-Ko chassis with an AKS hitch stabiliser and a receiver for an optional Secure wheel lock behind the ‘Tardis’ alloy wheels. There’s a spare wheel in an underslung carrier, too, and all services – even fridge and boiler vents – are relegated to the offside, well away from the awning. The hook-up socket is in the battery box, where you’ll also find an exterior satellite point, while the Whale submersible pump has an intelligent controller that will turn it off when your water container is empty. Access to the steadies is excellent: there are dedicated cutouts in the side skirts up front, and the rears are easy to find just below the back panel, despite the lack of guides. The only small complaint is that the waste drains are a fair way back from the axle line, so you’ll need to take care to get pitch perfect. You enter the 462 through a glazed two-piece stable door towards the rear, then walk through the kitchen to the large lounge, which is filled with light thanks to the huge 1.40x0.44m rooflight. It’s superbly finished, with a moulded surround that also incorporates a Heki over the kitchen, is embossed with the Compass name and fitted with LED downlighters. Elsewhere, the artificial lighting feels a little less sophisticated than some rivals, but it’s all-LED and the corner fittings give a warm light as they reflect against the fairly dark wood-effect lockers. The floral cushions, too, feel a little dated, but otherwise there is little to complain about in the large, comfortable lounge. The upholstery is neutral oatmeal with an attractive blue/green stripe, the cushions are comfortable and the sofas are huge – big enough for six sociable caravanners. When lounging, there’s a small pull-out table in the front chest plus thick, sculpted end bolsters for extra reclining comfort; for dining, it’s easy enough to retrieve the table from its dedicated storage in the washroom. The impressive sense of spaciousness continues in the galley. There’s no worktop extension flap, but there’s also no real need because the Compass Corona 462 has plenty of worktop. The finish is fairly traditional, with only a small window and no jazzy splashback, but there’s a large stainless-steel sink, a pair of 230V sockets, a dual-fuel hob plus a separate oven and grill. Above the 110-litre fridge is a small cutlery drawer, and there are further drawers plus a pan cupboard low down, along with two overhead lockers. If you want an Omnivent in place of the Heki it’s a £179 option, but this is otherwise a well-specified kitchen. On the opposite side of the van there’s a microwave, sensibly sited at chest height, with a locker above and beneath it a huge sideboard, large enough for a massive TV (with the relevant sockets) and still leaving space should you need additional worktop for food preparation. Under that, you’ll find two big drawers and a huge cupboard, plus a neat shelved corner unit alongside – the perfect place for keys and other paraphernalia, with a mirror above. There’s a generous kitchen bin fitted to the door, and the slab of rear bulkhead is broken up by an attractive ‘wave’ decoration beneath a pair of coathooks. Ralliers or caravanners who prefer sites with few facilities will find themselves well catered-for here. The end washroom is a fantastic size, with plenty of room for changing, and there are little luxuries such as a heated towel rail. The shower is in a separate circular cubicle, which is a good size with no obstacles in the tray, and there are moulded shelves for soaps and gels. The highlight for those who enjoy long-term touring will be the enormous nearside wardrobe, which has a full-width upper rail, a half-width lower rail, plus drawers, shelves and dedicated table storage that means it can be accessed even when the wardrobe is full. The only real criticisms are that it feels a little dark, despite the rooflight and a large opaque window, and that the finish is plain – though it is livened by a repeat of the ‘wave’ motif beneath a pair of towel hooks. As long as you are no more than 5ft 10in tall, the sofas are usable as single beds, and they are a reasonable width, too. However, most buyers are likely to opt for making them up into a large double bed, which is easily done by pulling out the slats beneath the front chest and rearranging the cushions. Even with the front chest in place, the double bed measures a more than generous 4ft 8in x 6ft 6in, but opt for wraparound front seating (a £199 option) and it can be stretched to a whopping 5ft 10in wide. Spotlights in all four corners of the lounge mean that there’s a reading light for every bed configuration, and the firm cushions are supportive. As if that huge bathroom wardrobe wasn’t enough, there are plenty of other storage options throughout the 462. So much so, that the free weight-plate upgrade to 1300kg may be a canny move, boosting payload from a slender 122kg to a useful 188kg. The use of that overhead rooflight rather than the fashionable front sunroof means that there’s space for six large overhead lockers in the lounge, half of which are shelved, all with positive catches. There’s a big void beneath the nearside sofa, and a smaller one on the offside, with both accessed by useful drop-down flaps, again with positive latches. It’s just a shame that there’s no external access to any of the storage spaces, meaning that the only place to stash muddy, wet gear is in the large front gas locker. The Compass Corona 462 is very much an example of building up to a standard rather than down to a price, and for a couple who don’t mind making up the bed each night and breaking it in the morning, it’s very hard to find fault with the 462. There are more modern-feeling rival caravans available, but few can compete with its breadth of talents. The Compass Corona 462 is spacious, practically laid out, thoughtfully designed and exceptionally well specified for the mid-market price-tag. You can browse through new and used Compass Corona caravans for sale here. Alternatives to use for comparison include the Adria Adora 432DT Loire at £15,450, the heaviest at 1300kg, and also the widest, giving a spacious feel. It has a luxurious spec and offers exceptional value, but lacks Alde heating. Another option might be the Bailey Pegasus Genoa, £17,169. Among the Corona’s closest rivals, in both price and dimensions, the Genoa is a shade heavier and does without both ATC and Alde heating. Finally, take a look at the Swift Challenger 480, £17,375. Smaller than the Corona, yet 44kg heavier, the Challenger 480 has smart looks (with a rakish Sterling Eccles twin), but Alde heating is a £749 optional extra.